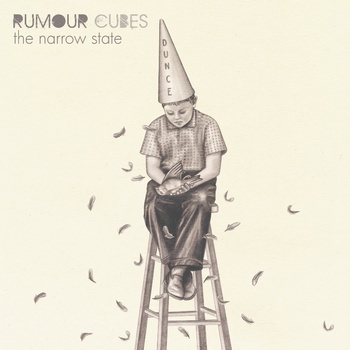 Rumour Cubes of London, England release their debut full release and it is real gem of an album. The album was recorded at the Cafe Music Studios (Orbital, Brian Eno, King Creosote) in east London. Honestly, there is not a bad track on the album. From the opening track, The University Is A Factory to the closer Tempus Figit, I must admit I have had this on replay quite a few times now. While the majority of the tracks are by no means heavy, Triptych is the exception, that seems to turn the songwriting on its head as it starts off heavy and mellows out, well somewhat mellows out. The musicianship is just amazing and you can tell that they have really worked at writing the songs on the album, this is a step away from the normal post rock release that can so easily be influenced by other artists. You can hear the passion in their music. The way they blend the strings into the songs is done with such beauty, and sometimes the strings are well in the forefront. Dont forget the drums, bass, guitars and electronica as they all play a vital part in this bands sound. So in summary…go check it out or you could miss one of the best releases of 2012 so far. This entry was posted on March 6, 2012, 10:10 pm and is filed under Playlists. You can follow any responses to this entry through RSS 2.0. You can leave a response, or trackback from your own site.